Click HERE to watch a 15-minute video on how the Historical Tools on PowerOptions can solve your back-testing needs! This discussion came from a Coaching Session with Bob, a PowerOptions Customer. Well, the Historical Tools will help us with that. Historical Chain. Look up the Option Chain on any stock, on any date back to April 2006. You can then move forward or backwards, to see the price and criteria change day by day. Or, move from one month to the next and beyond to see the chang e in price. Historical Search By Symbol: Select a Strategy (in this case, Long Calls). Select a Screen date back in time and then select the Expiration Time Frame. The Historical Search by Symbol will show you the positions that match those filters. You can then Calculate the Group Results to see the gain or loss at expiration, or look at the performance of an individual position over that time period. SmartHistoryXL: Just like the patented Search tool on PowerOptions, you can input your specific criteria in a strategy to see just those trades that would have matched your trading plan at any date back in time. As with the Historical Search By Symbol, you can then Calculate the Group Results or delve into the performance of an individual position from your screen. We show these 3 tools in the video, as well as the results based on Bob’s further criteria for his trading plan. Why Would You Need The Historical Tools? Have you ever wondered how Out of the Money Bull Puts would have performed on a particular stock, or ETF, over a 1-year, 2-year or 5-year period? Would Covered Calls on Dividend Paying stocks provide a better yearly return than Covered Calls on stocks with higher Volatility? Are your Naked Put or Spread Criteria successful over time? What was the last 5 day price change for all options on NFLX, AMZN, or any other security? If you have ever asked these questions, or any questions like this that can only be answered with historical options data…the Historical Tools are here for you. You can upgrade to the Historical Tools at any time from your current Delayed or RealTime subscription. Access to the Historical Options Data (back to April 2006) is only an additional $40 on top of your existing subscription. Simply Click Get History at any time to Upgrade! Don’t have a Subscription? Click HERE to Subscribe to PowerOptions and the Historical Tools! We also offer two Strategy and Optimization services where We Do the Work for you! …To see how your criteria would have performed over time. 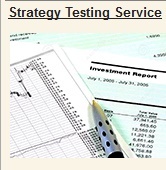 You can see more about The Strategy Testing Service HERE. Search Strategy Optimization: We can do the same steps above, BUT, Ernie and Mike will add their insight into your criteria, run various tests on adjusted criteria and trigger points, with a Guarantee that we can improve the testing results from your initial search parameters…or your money back. Check out the Search Strategy Optimization HERE. Call the Office or email us anytime with any questions you have about the Historical Tools and how they can work for you!